The ROK Straps leash is stretchy, shock absorbing, and incredibly tough. It has a solid elastic core covered with polyester fabric. It measures 54" long, and there is a non-stretching traffic handle located at the dog-end. This leash comes in ten colors and three sizes for use with dogs 10-150 pounds. This is, without a doubt, the most overbuilt leash I have ever used. I am absolutely certain that I am an average-sized person with an average-sized dog, but this leash makes me feel like a tiny person walking an Italian greyhound. Every single part of it is enormous. Heavy leash hardware annoys me because I like to use very small finger twitches to communicate with the dog. Big clonky hardware weighs everything down and interferes with my precision. 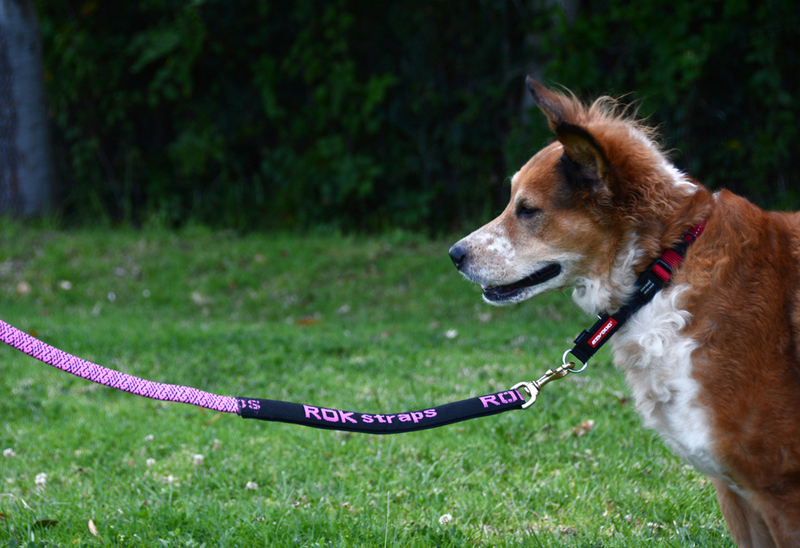 Our ROK Straps leash is a size medium, intended for dogs between 30 and 60 pounds. The clip on it could easily be used for a Saint Bernard, or possibly a small horse. The handle on this leash is extremely stiff. With my thin leather leashes I usually flip the handle loop inside out so it sort of hugs my hand and stays on with minimal effort. There is no flipping the ROK Straps leash handle inside out. It doesn't do any hand-hugging. It's be hard-pressed to get it snug on anything smaller than my thigh. This means I either have to actively grip the outside of the loop, or stick my entire arm through it and then bend my wrist awkwardly in order to grab the stretchy part. My hands are not so great at gripping stuff well or for any length of time. I got this leash specifically for foster puppy Xena because she would only walk on a stretchy leash at first. As soon as she hit the end of an unstretchy leash, she would drop down to the sidewalk on her belly and freeze. When I put my Ruffwear Roamer leash on her, there was no abrupt end of the line sensation so no reason for her to splat. The only problem with the Roamer is that it stretches to 7.5' long, and Xena spooks and bolts on a regular basis when we're near traffic. I had to hang onto the middle of the Roamer to keep her from running into traffic. The ROK Straps leash is only 4.5' long, and takes a lot more force to stretch. This gives Xena the shock absorption she needs to feel safe with the security I need to keep her on the sidewalk. The big clunky clip isn't such a big deal with Xena because it is attached to a harness, and because she is pretty oblivious. Brisbane is not a ROK Straps fan at all. He walks on a loose leash 99% of the time, and is acutely aware of the tiniest movement on my part. Wearing this leash is sort of like sticking a huge pair of noise canceling headphones on my partner and then trying to talk to them. It basically deadens all communication. Pros: Really super strong. Seriously. Can probably be used for resistance training, I am incapable of stretching this thing very far at all. Takes a fair amount of effort to stretch very far, and an enormous amount of effort to reach its 70" maximum. Absorbs the energy from a pulling dog and uses it to yank them back like a yo-yo. Eliminates shock from spooky bolting dogs and sudden movements from either dog or handler. Traffic handle is long enough to keep dog at my side without me bending over the whole time. Cons: Extremely heavy handle and hardware feel oversized on the medium leash. Handle is very stiff and awkward to hold. Bottom Line: I could probably use the small leash for dogs under 30 pounds on 40 pound Brisbane without worry. I seriously can't imagine breaking one of these things. It looks like I should be towing dirtbikes with it or something. I'm pretty sure this leash is made for pit bulls and similarly powerful dogs. For dogs that can rock a 2" wide collar, this leash rocks.